The February guide to Midwest finesse fishing contains nine logs and 6,042 words that detail how, when, and where four Midwest finesse anglers fished. It features the piscatorial endeavors of Rick Allen of Dallas; Mike Poe of Siler City, North Carolina; Preston Parks of Pittsboro, North Carolina; Steve Reideler of Denton, Texas; and not a soul from northeastern Kansas. In short, the weather and the black bass fishing were woeful at many locals across the Midwest and elsewhere during most of February’s 28 days. But Poe had a fruitful one on Feb. 6 by catching 30 largemouth bass in 52 minutes. In the trying waterways of north-central Texas, Allen and Reideler had a somewhat productive outing on Feb. 27. Reideler penned the majority of the 6,042 words and edited all of them several times. We are grateful, indeed, for his contributions. North-central Texas was very fortunate to have dodged the extreme arctic blast that paralyzed most of the heartland of the Midwest during the last week of January. And for the next few days, the daytime temperatures in our part of the country are forecast to reach 80 degrees by Feb. 4. 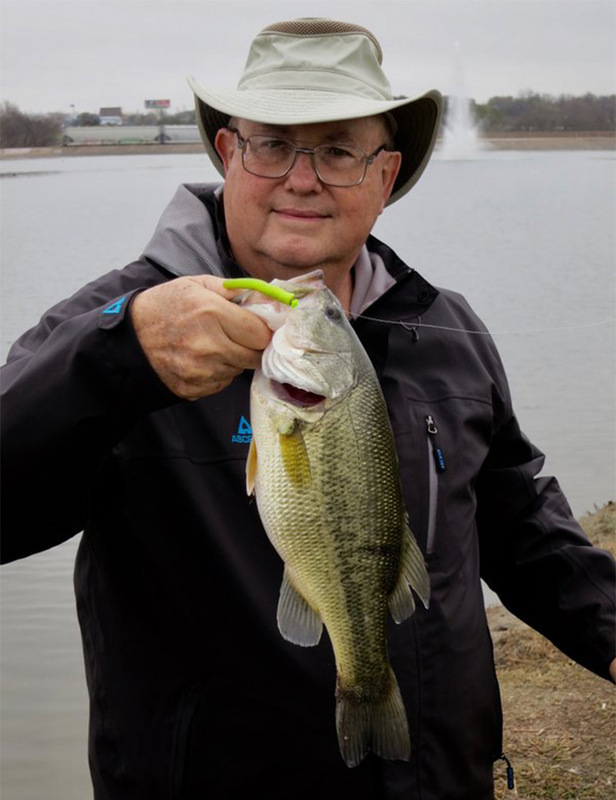 Rick Allen of Dallas and I had aspirations of catching a few largemouth bass at a couple of smaller municipal reservoirs that are situated in two communities north of Dallas. The sky was mostly overcast with a brief spell of sunshine. The morning low temperature was 53 degrees and the afternoon high temperature peaked at 66 degrees. The average low temperature for Feb. 2 is 34 degrees and the average high is 57 degrees. The wind blew out of the south by southeast at 8 to 10 mph. The barometric pressure measured 30.09 at noon and dropped to 29.78 by 4:00 p.m.
In-Fisherman’s solunar table indicated the best fishing would take place from 2:14 a.m. to 4:14 a.m., 8:26 a.m. to 10:26 a.m., and 8:51 p.m. to 10:51 p.m.
Rick and I were afoot at the first reservoir from about noon to 2:30 p.m., and we fished at the second one from 3:00 p.m. to 4:00 p.m. The water at the first community reservoir exhibited about 18 inches of visibility. The water temperature was 51 degrees in the main-lake area and 57 degrees inside a small feeder-creek arm on the northeast end of the reservoir. The water level was normal. We started fishing along the east shoreline, which is curved. Its north and south ends are flat and the middle section is steeply sloped. Along this shoreline, we failed to entice any strikes from two points, a long sand and gravel ledge, and a shallow ditch. From the east shoreline, we moved to the dam. The dam is constructed of large concrete slabs and forms the reservoir’s southern boundary. We were unable to provoke any strikes here. Along the west side of the reservoir, we slowly dissected a steep 35-yard section of a sand and gravel shoreline, the area around a fishing pier, and two tertiary points on each end of the steep section of this shoreline, but we were unable to generate any strikes. The north end of this reservoir encompasses a large and shallow mud flat that is lined with tall stands of cattails and a small feeder creek that enters the reservoir from the east end of this shoreline. The water was 57 degrees inside this creek arm, and we caught one largemouth bass from a patch of submerged rocks in three feet of water. This largemouth bass was caught on a Z-Man’s PB&J TRD TubeZ affixed to a blue 1/20-ounce Z-Man’s Finesse ShroomZ jig. This was the only strike and largemouth bass that we caught at this reservoir. After we finished fishing at the first community reservoir, we drove about 15 miles to the second one. The water temperature at this reservoir was 52 degrees. The water level was normal. The water displayed about 1 1/4 feet of clarity. We used a variety of Z-Man’s Midwest finesse lures attached to an array of sizes and colors of Z-Man’s Finesse ShroomZ jigs, and we failed to provoke any strikes from several points, a mud flat, a small feeder-creek, and a couple of shallow gravel and clay ledges. In short, the fishing was wretched. We struggled mightily to catch one largemouth bass from our two most fruitful community reservoirs during our 3 1/2 hours of fishing. Even though the weather was splendid for this time of year, the black bass fishing remains in a sorry state. Mike Poe of Siler City, North Carolina, filed this brief on the Finesse News Network about his trying outings on Feb. 2 and 3. Recently, we have had some beautiful weather hereabouts with area thermometers ranging from the low 50s to the high 70s. Consequently, area anglers were predicting that the fishing was about to bust wide open. And I thought this bonanza had begun when our son-in-law, Preston Parks of Pittsboro, North Carolina, caught a 10.25-pound largemouth bass on Feb. 1. But when I went fishing on Feb. 2, I struggled to catch three largemouth bass in 4 1/2 hours at a community reservoir. Two were caught on a Z-Man’s Junebug Hula StickZ affixed to a weedless 1/15-ounce Z-Man’s Finesse ShroomZ jig. One was caught while I was power fishing with a crankbait. The water exhibited two to eight inches of clarity. The water level was normal. I was unable to get the surface temperature. Then on Feb. 3, Preston and I fished together for six hours, using power and Midwest finesse tactics, and it was a horrendous struggle for us to catch two largemouth bass. We were astounded by the lack of baitfish and other fish in the upper reaches of the small feeder-creek arms of this community reservoir. Our depth finder showed that most of them were abiding in the basin of the reservoir and miles away from the creeks. The surface temperature ranged from 45 degrees at the beginning of this outing to 49 degrees in the afternoon. When a similar warm-weather phenomenon occurred in February of 2018, our fishing was amazingly fruitful. I will be surprised if we fail to have another round of stellar largemouth bass fishing this February. I suspect it will erupt sometime this week, and I am hoping that I can get afloat. The weather has felt more like spring during the past couple of days in north-central Texas. One local meteorologist reported that the morning low temperature was 59 degrees and the afternoon high soared to 84 degrees, which is a new record high for Feb. 4. It was sunny with a few thin cirrus clouds drifting slowly across the powder-blue sky. The barometric pressure ranged from 29.84 at 1:00 p.m. to 29.80 at 3:00 p.m. The wind quartered out of the west, southwest, south, and southeast at 5 to 9 mph. A home project took up most of my day, but I did manage to get out in the delightfully warm weather for a couple of hours to conduct a solo afternoon bank-walking outing at two community reservoirs that lie adjacent to each other in a suburb south of Denton. The best fishing, according to In-Fisherman’s solunar calendar, would occur from 3:36 a.m. to 5:36 a.m., 9:58 a.m. to 11:58 a.m., and 10:22 p.m. to 12:22 a.m. I was afoot from 1:00 p.m. to 3:00 p.m.
At the first community reservoir, the water displayed about 14 inches of visibility. The water level was slightly high. I was surprised to discover that the water temperature was 61.8 degrees, which is the warmest I have ever seen it in early February. The submerged terrain is composed of clay, silt, and gravel. The north shoreline is steeply sloped and features a small concrete water outlet. The west shoreline is endowed with a small rock pile that lies about 10 yards north of a broad clay point. A shallow clay and gravel flat occupies the reservoir’s south end. A small feeder-creek is situated on its east end. There are thick stands of cattails that festoon a goodly portion of the water’s edge. The east shoreline is mostly flat and straight. A shallow clay ledge runs parallel and within four feet of this shoreline. I focused on the most promising features of this impoundment, and I was baffled that I could not generate a single strike. The community reservoir adjacent to the first one is larger than the first one and is about the size of a football field. Its underwater terrain is similar to the first reservoir and consists of primarily gravel, silt, and clay. The water in this reservoir exhibited about 18 inches. The water temperature was 61.3 degrees, and I have never seen it this warm in early February. The water level was normal. The north shoreline is flat and is endowed with several small clay points and a small concrete water outlet. The east end of the reservoir has the deepest water. It is endowed with a steep shoreline, and its underwater terrain consists of clay. The south shoreline is steeper than the northern and western ones, and it is adorned with a decorative stone wall and several prominent points. The west end of the impoundment is comprised of a large cove and a large island that is situated near the mouth of the cove. Two creek channels run parallel to the island’s northern and southern shorelines. The fishing was as exasperating at this reservoir as it was at the first one, and I could muster only one strike that yielded one largemouth bass. It was caught in five feet of water from the end of a small point near the concrete water outlet in the middle portion of the north shoreline. It was caught while I was executing a slow swim-glide-and-shake retrieve with a 2 1/2-inch Z-Man’s pumpkin-chartreuse ZinkerZ rigged on a red 1/20-ounce Z-Man’s Finesse ShroomZ jig. I failed to garner any strikes with a Z-Man’s 2 3/4-inch black-blue TRD TubeZ rigged on a blue 1/20-ounce Z-Man's Finesse ShroomZ jig, a Z-Man's green-pumpkin TRD HogZ affixed on a blue 1/20-ounce Z-Man's Finesse ShroomZ jig, a 1/8-ounce black-blue Z-Man's Micro Finesse skirted jig with a Z-Man’s black-blue TRD CrawZ threaded on the jig as a trailer, a shortened four-inch Z-Man's watermelon-red Finesse WormZ attached to a red 1/20-ounce Z-Man's Finesse ShroomZ jig, a shortened four-inch Z-Man’s redbug Finesse WormZ affixed on a chartreuse 1/20-ounce Z-Man's Finesse ShroomZ jig, and a Z-Man's pumpkin CrusteaZ attached to a chartreuse 1/20-ounce Z-Man's Finesse ShroomZ jig. 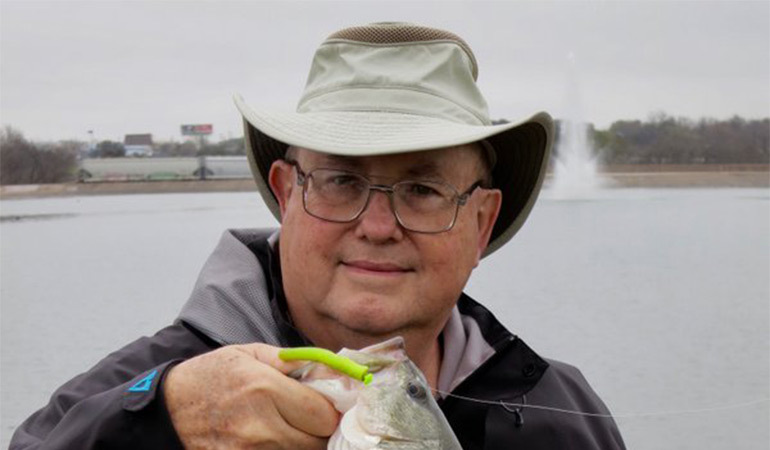 So far, the bass fishing in 2019 has been a bust and worse than it was in 2018, which was also a challenging year for black bass fishing in north-central Texas. During the first 35 days of 2019, I and a couple of my companions have fished five times and we caught a total of 19 largemouth bass during 19 1/2 hours of fishing. Seventeen of them were caught in January and two were caught in February. This calculates to a paltry catch rate of less than one bass per hour and three bass per outing, which is about average for this time of year. The first 35 days of 2018 was a tad more fruitful. My cohorts and I fished 11 times for 36 hours, and we caught a total of 86 largemouth and spotted bass. Sixty-four were caught in January and 22 were caught during the first week of February. This calculates to seven bass per outing and two bass per hour. In closing, we have come to the disheartening conclusion that this awful downward trend in the black bass fishing in north-central Texas has become commonplace, and it will probably continue for days and weeks to come. 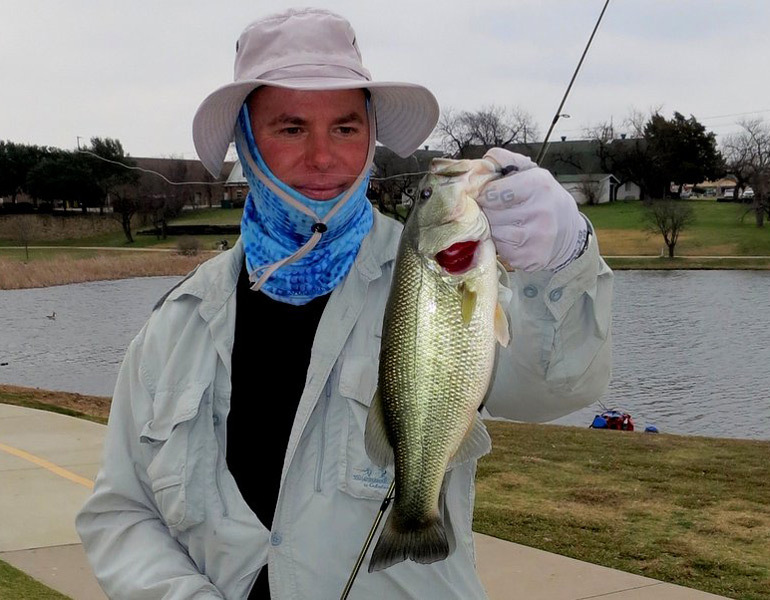 Steve Reideler of Denton, Texas, posted a log on the Finesse News Network about his Feb. 6 outing. The wonderful spell of warm spring-like weather is expected to come to an end as another cold-winter blast is expected to plow across the north-central Texas’ landscapes during the late evening hours of Feb. 6. I thought I would take advantage of this last day of warm weather by conducting a solo bank-walking excursion at a community reservoir located in a northwest Dallas’ suburb. Rick Allen of Dallas and I fished this same community reservoir on Feb. 2, and it was a trying task for us to catch one largemouth bass. I had hopes that the black bass fishing at this reservoir would be better than it was on Feb. 2, and it was. It rained lightly during the early morning hours of Feb. 6, and when the rain stopped, it remained overcast. One local television meteorologist was forecasting colder temperatures and rain during the late evening hours, and the cold rain would continue into Feb. 7. The morning low temperature on Feb. 6 was 59 degrees and the afternoon high peaked at 77 degrees. The barometric pressure was 29.81 at noon and fell to 29.72 by 3:00 p.m. The wind blew incessantly out of the south at 12 to 20 mph with gusts up to 25 mph. In-Fisherman’s solunar calendar indicated the most lucrative fishing would occur from 5:20 a.m. to 7:20 a.m., 11:09 a.m. to 1:09 p.m., and 11:31 p.m. to 1:31 a.m. I fished from noon to 3:00 p.m. The water level was normal. The water exhibited about 18 inches of visibility. I was astounded to discover that the water temperature was 63 degrees, which is unusual for this reservoir in February. I began the outing at the west shoreline, which is steep. Its underwater terrain consists of sand and gravel. A shallow ditch adorns the northern end of this shoreline and courses across a large mud flat. A fishing pier is positioned along the middle portion of this shoreline. Two tertiary points are located about 30 yards north of the pier. Another gravel and sandy tertiary point lies about 50 feet south of the fishing pier. I caught three largemouth bass in six to eight feet of water around the edges of the ditch along the north end of the shoreline. Two were caught on back-to-back casts. They were caught on a Z-Man’s molting craw TRD HogZ rigged on a blue 1/20-ounce Z-Man’s Finesse ShroomZ jig. This combo was employed with a slow drag-shake-and- deadstick presentation. The deadstick portion of this presentation lasted three to five seconds. The steep sand and gravel shoreline around the fishing pier and the two tertiary points north of the pier failed to yield a strike. The tertiary point south of the pier surrendered one largemouth bass. This largemouth bass was abiding in five feet of water and about 25 feet from the water’s edge. It was also bewitched by the molting craw TRD HogZ rig and slow drag-shake-and-deadstick retrieve. After I finished fishing the west shoreline, I plied the area around the concrete-slab dam that forms the southern perimeter of the reservoir, and I failed to garner any strikes. From the dam, I moved to the east shoreline and worked my way northward. The southern and northern sections of this shoreline are flat. But it is steep along its middle section, and it is also endowed with a broad sand and gravel point. Lying about 60 feet north of this point, there is a long clay and gravel point that extends westward toward the middle of the reservoir. A long and shallow sand and gravel ledge parallels most of this shoreline. I caught three largemouth bass that were relating to the deep-water side of the shallow ledge on the south end of the shoreline. These largemouth bass were abiding in four to six feet of water. Two were enticed by the molting craw TRD HogZ rig and slow drag-shake-and-deadstick presentation. The other one was tempted by a shortened Z-Man’s molting craw Hula StickZ fastened on a chartreuse 1/20-ounce Z-Man’s Finesse ShroomZ jig. This combo was also manipulated with a slow drag-shake-and-deadstick presentation. The broad middle point relinquished another largemouth bass. It was caught from the end of the point in five feet of water and about 10 feet away from the submerged ledge. It was attracted to a slow drag-shake-and-deadstick retrieve with the molting craw TRD HogZ rig. I caught one largemouth bass in five feet of water from the side of the long clay and gravel point on the north end of the shoreline. It engulfed the molting craw TRD HogZ combo, which was retrieved with a drag-shake-and-deadstick presentation. The north end of the reservoir consists of a large and shallow mud flat that is dissected with a small feeder creek and tall stands of cattails, but I did not have enough time to fish this area. Overall, the fishing was better than I thought it would be. I managed to catch and release nine largemouth bass in three hours, which is the most fruitful outing I have had in 2019. The six largest ones were decent-size specimens that weighed between 2 1/4 and 2 3/4 pounds. Eight of the nine largemouth bass were allured by the Z-Man’s molting craw TRD HogZ rig and a slow drag-shake-and-deadstick retrieve. One largemouth was beguiled by the shortened molting craw Hula StickZ rig and a slow drag-shake-and-deadstick presentation. I also utilized some suspending jerkbaits and small crankbaits, but I was unable to generate any strikes with them. Mike Poe of Siler City, North Carolina, posted a brief on the Finesse News Network about his Feb. 6 outing. Since Feb. 1, we have been anticipating that this week would be a stellar one for catching largemouth bass in central North Carolina. Our nighttime temperatures have been reaching record-high levels, and our daytime temperatures are climbing into the upper 70s. During the late afternoon of Feb. 6, the wind was angling out of the south. It was cloudy. Area thermometers were in the 70s. My only option was to fish a nearby farm pond, where I wielded a 2 1/2-inch Z-Man’s PB&J ZinkerZ affixed to a red 1/16-ounce mushroom-style jig. And I caught 30 largemouth bass and four bream in 52 minutes. I employed a variety of retrieves, but the bulk of these largemouth bass preferred a dropping presentation versus a steady-shake one, and one largemouth bass, however, engulfed the ZinkerZ rig as it hit the surface of the water. They were abiding within a couple feet of a shallow shelf that parallels the shoreline. They ranged in size from 10 inches to two pounds. Across the years, we have found that the farm ponds and other small waterways are the first ones to become fruitful in this part of North Carolina during the first warm-weather spell of the year. During this spell, this simple Midwest finesse rig is deadly effective for catching the largemouth bass that reside in the farm ponds. The late Buck Perry famously said that if we expected to catch fish in the same places or the same way on consecutive days, we stood to be disappointed. I made him look like a genius yesterday. After catching 30 largemouth bass in 52 minutes on Feb. 6 at a nearby farm pond with a 2 1/2-inch Z-Man’s PB&J ZinkerZ affixed to a red 1/16-ounce mushroom-style jig, I planned to catch oodles of them on the same rig on this Feb. 7 outing at two ponds that lie inside a local industrial park. Both of these ponds had all the benefits of our spell of warm weather and southerly winds. In fact, the air temperature when I started fishing was 78 degrees. The nighttime low temperature had been 65 degrees. This was a perfect weather scenario for a February largemouth bass bonanza in central North Carolina. To my dismay, however, after I fished an entire lap around both ponds, I had landed only two largemouth bass on my ZinkerZ rig, and I elicited one strike that I failed to hook. Various retrieves and depths were tried, and all were equally unproductive. I may have overestimated the largemouth bass population in these ponds. I know other anglers caught an array of largemouth bass at other waterways on Feb. 7, and some of those largemouth bass were big ones. For instances, my son-in-law Preston Parks of Pittsboro, North Carolina, caught 16 largemouth bass at a U.S. Army Corps of Engineers’ reservoir, and the five biggest weighed slightly more than 30 pounds. Maybe I was fishing for ghosts in these two ponds. It was the first time that I have ventured to these two ponds. They looked good from afar. But up close, they were very murky, cluttered with filamentous algae, and exhibited no signs of minnow and baitfish life adjacent to the edges of the shorelines. At any rate, it was a humbling outing. The weather will be turning cold again. So, the window for the easy fishing closes tonight here. It was a missed opportunity for me. I should have fished at a well-known locale during these prime conditions. Mike Poe of Siler City, North Carolina, posted a brief on the Finesse News Network about his Feb. 10 outing. After the spell of warm weather that had area thermometers registering temperatures in the 70s, it became cold again, and those thermometers struggled to climb into the high 40s. At noon on Feb 10, it was 37 degrees. It was cloudy, and it was raining a touch. I fished at a community reservoir from 2:00 p.m. to 5:30 p.m. The water exhibited about 12 inches of visibility. I spent those 3 1/2 hours plying little sections of rocky shorelines adjacent to a submerged creek channel inside one of this reservoir’s feeder-creek arms, and these rock-laden terrains were covered with five feet of water. Inside another feeder-creek arm, I also fished along another shoreline that is adjacent to a submerged creek channel, and this shoreline is embellished with overhanging willow trees, and the water at this locale had a depth of three feet. I caught 12 largemouth bass. Two of them were caught on a red crankbait, and 10 were caught on a 2 1/2-inch Z-Man’s PB&J ZinkerZ affixed to a red 1/16-ounce mushroom-style jig. I caught two of the 10 largemouth bass on back-to-back casts with the ZinkerZ rig at one of the overhanging willow trees. It is a tree that yielded a nine-pound largemouth bass a few springs ago, and I caught it on a ZinkerZ rig just as my father was saying that this rig never catches any big largemouth bass. These two were not nine-pounders, but they were nice ones, and catching them on back-to-back casts was really sweet. I also caught a four-pounder and a couple of three-pounders on a day when the strikes were sparse. I used two retrieves. Along the deeper and rocky sections, I used a shake as the rig dropped to the bottom, and then I employed a deadstick-and-shake presentation on the bottom. The largemouth bass were picking it up on the bottom. Around the overhanging willow trees, the largemouth bass were caught underneath the overhanging limbs. There is usually a clean spot underneath the limbs, and these spots are where you can get the ZinkerZ rig in it without it becoming snagged. These spots are where the tiny hook of our mushroom-style jig reigns; they do not become snagged as readily as a big one does. The two biggest largemouth bass were caught on the initial fall. After decades of flipping power baits around overhanging willow trees at John H. Kerr Reservoir on the border of Virginia and North Carolina, I developed a hatred of fishing overhanging willow trees. But nowadays, I truly enjoy skipping my small ZinkerZ rigs under those trees and leading lunkers out of the mess of limbs. It has added a new and much appreciated dimension to late-winter largemouth bass fishing in this part of North Carolina. To our chagrin, this week’s weather forecast notes that we will be ensnared with spells of cold rain. It has been mostly cold and wet in north-central Texas this February, and when it wasn’t raining, the wind has been howling. I have not fished since Feb. 15 when Rick Allen of Dallas and I fished at a popular but challenging U.S. Army Corps of Engineers’ reservoir in an exurban area of north-central Texas. It was overcast and gloomy on Feb. 15. The morning low temperature was 47 degrees and the afternoon high peaked at 63 degrees. The wind angled out of the northwest at 7 to 20 mph with gusts up to 25 mph. The water level was about normal. The water temperature ranged from 46 degrees in the main-lake area to 50 degrees inside a small cove. We fished for four hours, and the fishing was so horrendous that we elicited only one strike. That fish was momentarily hooked then lost. We did not see the fish, but it exhibited the mannerisms of a freshwater drum. The remainder of the outing turned into an afternoon of tedious casting practice. In contrast to Feb. 15, it was sunny and pleasant on Feb. 25. The wind angled out of the southeast at 10 to 15 mph. The barometric pressure measured 30.25 at noon and 30.18 at 4:00 p.m. I decided to spend part of the afternoon fishing from the shorelines of a heavily-fished community reservoir located in a suburb northwest of Dallas. The water level was normal. The water exhibited about 18 inches of visibility. The water temperature was 52 degrees in the south end of the reservoir and 53 degrees along its northern end. I began the outing along the west shoreline. It possesses a 25- to 30- degree slope. Its underwater terrain consists of sand and gravel. This shoreline encompasses a shallow ditch that courses across a large mud flat on the north end of the reservoir. A fishing pier is situated at the middle section of this shoreline. Two tertiary points are located about 90 feet north of this pier, and a gravel and sandy tertiary point lies about 50 feet south of the pier. I failed to garner any strikes around the edges of the ditch on the north end of this west shoreline. The steep sand and gravel shoreline around the fishing pier and the two tertiary points north of the pier also failed to yield a strike. The small tertiary point south of the pier surrendered one largemouth bass. This largemouth bass was abiding in six feet of water and about 25 feet from the water’s edge. It was caught on a Z-Man’s molting craw TRD HogZ rigged on a custom-painted blue 1/15-ounce Z-Man’s Finesse ShroomZ jig that was employed with a slow drag-shake-and-deadstick retrieve. From the west shoreline, I moved to the concrete dam that forms the southern boundary of the reservoir. A small patch of winter-dead aquatic vegetation is situated near the west end of the dam in about five feet of water, and it yielded two largemouth bass. One was caught on the molting craw TRD HogZ rig. The other one was coaxed into striking a Z-Man’s California craw TRD TubeZ fastened on a custom-painted chartreuse 1/20-ounce Z-Man’s Finesse ShroomZ jig. Both of these rigs were slowly dragged, shaken, and deadsticked along the bottom and through the patch of submerged vegetation. In the center portion of the dam, there is a large bulge in the concrete that extends a few feet into the reservoir. This area surrendered one largemouth bass that engulfed the molting craw TRD HogZ rig as it was slowly worked with a drag-shake-and-deadstick retrieve about 25 feet from the water’s edge. I failed to generate any strikes along the east end of the dam. After I finished dissecting the areas around the dam, I moved to the east shoreline and worked my way northward. A long and shallow ledge parallels most of this shoreline, and its underwater terrain consists of gravel and sand. The midsection of this shoreline features a broad point that is steep and possesses about a 30- to 35-degree slope, and its underwater terrain consists of gravel and sand. The southern and northern sections of this shoreline are flat. On the north end of this shoreline, there is a long clay and gravel point that extends westward toward the middle of the reservoir. To the south of the long clay and gravel point, a narrow trough or ditch parallels the shoreline. I failed to evict any strikes from the submerged ledge on the south end of the shoreline or from the area around the steep sand and gravel point in the middle section of the shoreline. I caught three largemouth bass that were relating to the bottom of the trough or ditch and about 40 feet north of the steep point. These largemouth bass were abiding in six feet of water. Two were enticed by the molting craw TRD HogZ rig and a slow drag-shake-and-deadstick presentation. The other one was tempted by the California craw TRD TubeZ combo that was also retrieved in a slow drag-shake-and-deadstick manner across the bottom. The south side of the long clay and gravel point along the north end of this shoreline also relinquished three largemouth bass. They were abiding in five feet of water. Two of them were attracted to the molting craw TRD HogZ combo as it was slowly being dragged, shaken, and deadsticked across the bottom and parallel to the side of the point. The other one engulfed the California craw TRD TubeZ rig as it slowly settled to the bottom on the initial drop. The north end of the reservoir consists of a large and shallow mud flat that is dissected with a small feeder creek and tall stands of cattails, but I did not fish this area. In sum, the fishing has been awful this year and I would have been happy catching a couple of largemouth bass during this outing. But by the time this outing came to a close, I was delighted to have tangled with 10 largemouth bass in 3 1/2 hours. Seven of them weighed between 2 1/4 and 3 1/2 pounds. The other three weighed between one pound, two ounces and one pound, 14 ounces. 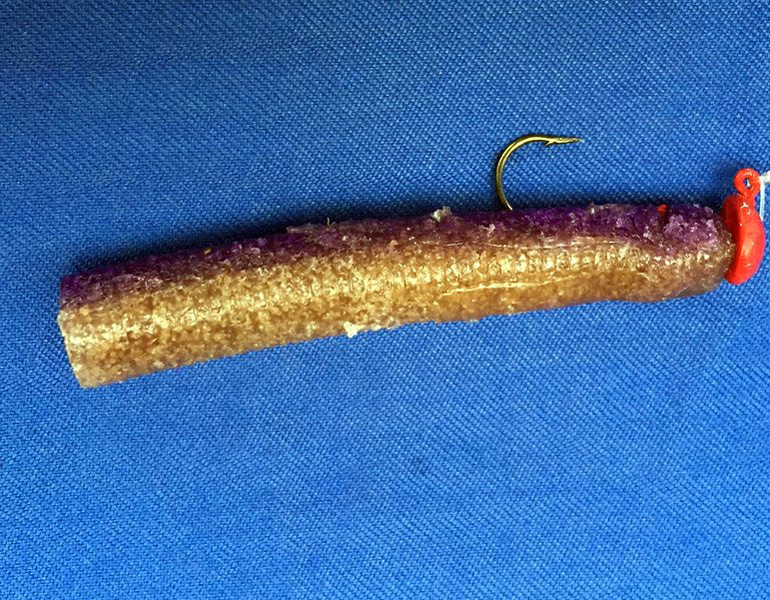 Seven of the 10 largemouth bass were allured by the Z-Man’s molting craw TRD HogZ rig. Three largemouth bass were bewitched by the California craw TRD TubeZ combo. A slow drag-shake-and-deadstick retrieve was the most effective presentation. The weather in north-central Texas has been in a continuous flux this winter. Daytime temperatures have varied from the low 30s to mid-40s for three or four days followed by several days of more moderate temperatures that range from the mid-50s to the low 70s. Feb. 27 was a combination of both worlds. The morning hours were overcast and foggy with an occasional spell of light drizzle. There was a slight whisper of wind meandering out of the south at less than 5 mph. It was 54 degrees at 6:00 a.m. and 63 degrees at 2:00 p.m. But around 3:00 p.m., a cold front pushed through the Dallas-Ft. Worth metropolitan areas. The sky remained covered with thick grey clouds, and the air temperature dropped to 34 degrees by 5:55 p.m. The morning’s mild-mannered wind turned from the south and began to blow vigorously out of the north by northwest at 19 to 22 mph. The barometric pressure measured 30.09 at 11:00 a.m. and 30.06 at 2:00 p.m. I joined Rick Allen of Dallas for 3 1/2 hours on a bank-walking excursion at the same community reservoir that I fished on Feb. 25. It lies on the north side of the Dallas metropolitan area. It also has been our only productive venue for the past few weeks. According to In-Fisherman's solar calendar, the most productive fishing would occur from 5:05 a.m. to 7:05 a.m., 5:30 p.m. to 7:30 p.m., and 11:18 p.m. to 1:18 a.m. Rick and I fished from 9:30 a.m. to 1:00 p.m. The water exhibited about 1 1/2 feet of clarity. The water temperature was 54.7 degrees on this outing, and it ranged between 52 and 53 degrees on Feb. 25. The water level was normal. We dissected the sides of a long clay and gravel point on the north end of the reservoir’s east shoreline, and we caught two largemouth bass that were extracted from four to six feet of water from the south side of the point. We caught three largemouth bass that were dwelling in five feet of water around a shallow ditch that lies just south of the clay and gravel point. In the midsection of this east shoreline, we caught one largemouth bass from the south side of a steeply-sloped sand and gravel point in six feet of water. We failed to entice any strikes along the concrete-slab dam on the south end of the reservoir. The area around the dam relinquished three largemouth bass on Feb. 25. On the west side of the impoundment, we slowly and meticulously dissected a section of its steep sand and gravel shoreline, the area around a fishing pier, and a shallow-water ledge on the south end of a large mud flat that forms the north end of the reservoir. We caught two largemouth bass from a 25-yard section of the sand and gravel shoreline on the south end of this west shoreline. They were abiding in four to six feet of water. Two largemouth bass were extracted from six to eight feet of water from the north side of the fishing pier, which is situated in the middle portion of this shoreline. On the north end of this west shoreline, we caught four largemouth bass that were caught in three to six feet of water. These bass were relating to a shallow-water drop off where the southwest end of the shallow-water mud flat drops off into deeper water. All told, this was our most fruitful outing of 2019. We caught 14 largemouth bass in 3 1/2 hours, which we consider a splendid outing for February. We also enticed a couple of other strikes that we failed to hook. Five largemouth bass were tempted by a Z-Man’s molting craw TRD HogZ rigged on a blue 1/15-ounce Z-Man’s Finesse ShroomZ jig. Another five largemouth bass were caught on a shortened Z-Man’s molting craw Hula StickZ attached to a blue 1/16-ounce mushroom-style jig. Four largemouth bass were caught on a 2 1/2-inch Z-Man’s pumpkin-chartreuse ZinkerZ threaded on a chartreuse 1/20-ounce Z-Man’s Finesse ShroomZ jig. The Z-Man’s molting craw TRD HogZ and molting craw Hula StickZ rigs were employed with a slow drag-shake-and-deadstick presentation. The 2 1/2-inch Z-Man’s pumpkin-chartreuse ZinkerZ was utilized with a slow swim-glide-and-shake retrieve. We also wielded a Z-Man’s PB&J TRD TubeZ affixed on a blue 1/20-ounce Z-man’s Finesse ShroomZ jig, a California craw TRD TubeZ on a chartreuse 1/20-ounce Finesse ShroomZ jig, a Canada craw TRD CrawZ on a chartreuse 1/20-ounce Finesse ShroomZ jig, and a green-pumpkin Finesse ShadZ on a chartreuse 1/20-ounce Z-Man’s Finesse ShroomZ jig, but we were unable to provoke any strikes with these offerings. We shared this reservoir with three other anglers. About halfway through this outing, one of those anglers spoke with us and reported that he had not generated a single strike with his drop-shot rig and lipless crankbait.